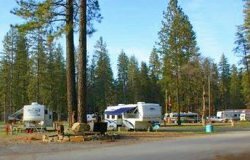 Whether you’re visiting one of the Fairground’s activities or visiting our area for a vacation, the RV park at the Nevada County Fairgrounds is open year-round*. We are an RV park in a campground setting. Our facilities are nestled among tall pine trees, providing a serene setting and encouraging a safe camping experience. The Fairgrounds are centrally located in the heart of Nevada County, near the historic towns of Grass Valley and Nevada City. The RV Park has 44 sites with full hook-ups, approximately 100 sites with water and power hook-ups, and numerous RV sites without hook-ups throughout the grounds. Showers and a convenient dump station are located within the RV Park.